This is the best Yebeg Wat in the city, a dish that has become increasingly hard to find in restaurants. The spicing is terrifically complex and spicy. The vegetables are excellent, too. The food reminds me of the way Ethiopian food used to taste in this town back in the 1980's before it became Americanized. One of the best food trucks for vegetarian food. The cooking is better than most brick-and-mortar Ethiopian restaurants, in my opinion, and definitely better than the Fojol Ethiopian truck. My favorite dish from Lilypad is the collard greens, but all three veggie combo items are delicious. Good amount of food for the price compared to other area food trucks. The women who staff the truck are really nice, too. They were fantastic. Ethiopian is my favorite, and they really do it well. The service was excellent...when I wasn't sure what I wanted, they gave me samples, and were super kind with making sure everything was ok. Portions were incredibly generous, and really good injera. Delicious ethiopian. They often have interesting variations on the familiar favorites. Good price, and lovely cashier. I was happy to find an Ethiopian food truck. The 3 veggie combo game with spicy red lentils, yellow split peas, greens, and 2 rolls of injera. Another time I ordered the same platter and got cabbage and carrots as the 3rd veg. The lentils are my favorite dish, but everything is well-seasoned and tasty. A surprisingly large amount of food and a good value for ~$8; I had leftovers for dinner. I really enjoyed everything on my plate, and the portions were good sized. The beef, lentils and cabbage were all delicious, especially when eaten with the injera. I don't have any picky comments at all - it was just perfect Ethiopian food to me. Looking forward to their next visit to L'Enfant. The lentils were well curried, spicy and garlicy. This paired well with smooth creamy split peas with a much more temperate heat level. The injera was a little soggy, but with the sour fermented effect I enjoy so much about Ethiopian teff and harmonized with the almost pickled cabbage and carrots. Portions were PLENTY for $7.50! Aug 21, 2012 by jonny s.
Food was delicious -- I don't know exactly what everything was, but there was a meat dish (lamb, maybe? ), lentils (I think), collard greens (superb!!) and some potatoes. Plenty of the bread you use to eat with, and they give you napkins when they hand you your order, which is awesome for me because I always forget to grab napkins and that's a dangerous mistake when eating ethiopian. Portions were great too -- more than enough for me and I had plenty to give the homeless dude on the walk back to the office. 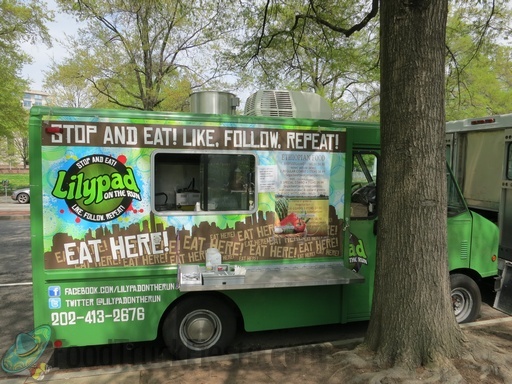 Lilypad On The Run DC food truck serves a mix of sandwiches and rice and noodle dishes. They launched on March 26, 2012. New truck wrap and new Ethiopian menu, as of August 18, 2012.